Received: December 13, 2016; Accepted: January 2, 2017; Published online: April 1, 2017. Functional gastrointestinal disorders (FGIDs) are diagnosed and classified using the Rome criteria; the criteria may change over time as new scientific data emerge. The Rome IV was released in May 2016. The aim is to review the main changes in Rome IV. FGIDs are now called disorders of gut-brain interaction (DGBI). Rome IV has a multicultural rather than a Western-culture focus. There are new chapters including multicultural, age-gender-women’s health, intestinal microenvironment, biopsychosocial, and centrally mediated disorders. New disorders have been included although not truly FGIDs, but fit the new definition of DGBI including opioid-induced gastrointestinal hyperalgesia, opioid-induced constipation, and cannabinoid hyperemesis. Also, new FGIDs based on available evidence including reflux hypersensitivity and centrally mediated abdominal pain syndrome. Using a normative survey to determine the frequency of normal bowel symptoms in the general population changes in the time frame for diagnosis were introduced. For irritable bowel syndrome (IBS) only pain is required and discomfort was eliminated because it is non-specific, having different meanings in different languages. Pain is now related to bowel movements rather than just improving with bowel movements (ie, can get worse with bowel movement). Functional bowel disorders (functional diarrhea, functional constipation, IBS with predominant diarrhea [IBS-D], IBS with predominant constipation [IBS-C], and IBS with mixed bowel habits) are considered to be on a continuum rather than as independent entities. Clinical applications such as diagnostic algorithms and the Multidimensional Clinical Profile have been updated. The new Rome IV iteration is evidence-based, multicultural oriented and with clinical applications. As new evidence become available, future updates are expected. This was accomplished by a rigorous process of prospective and retrospective data collection, synthesis, data discussion, group decision making, and peer-review.13Table 1 summarizes the Rome IV process. A FGID (eg, functional heartburn and IBS) relates to the patients’ interpretation and reporting of the illness experience, and it is classified primarily in terms of symptoms. A symptom is an experience perceived as different from normal, while a syndrome (eg, any of the FGID) is a consistent association of symptoms.13 While a FGID may have an abnormal motility finding such as rapid intestinal transit in IBS patients with diarrhea (IBS-D)14 or a pathologic finding such as increased in colonic mucosal mast cells,15 these factors are neither sufficient nor necessary for defining a FGID. Thus, by moving from motility based categorization to a symptom based method we can identify underlying pathophysiological determinants, be they motility, hypersensitivity, or brain-gut dysfunction. This classification based on symptom groupings (developed by population cluster analysis and clinical studies) thus represent what patients bring to doctors. This approach opens the door for the study of additional pathophysiological processes. It is not coincidence that the growth in the work on visceral hypersensitivity and sensitization, brain-gut interactions, microbiota etc, began right at the time of the classification system published in 1990.16–19 Because patients were selected for these studies based on symptom criteria which defined the cohorts. Other benefits include the ability of having homogeneous groups for clinical trials with the Food and Drug Administration (FDA) and European Medicines Agency endorsement of these criteria. This led to a marked increase in drug discovery and use.20–22 Finally such a classification system provides legitimization for patients and doctors. Although the word functional has been embedded in our terminology, there has been a longstanding discussion to eliminate this term because of the term being non-specific and potentially stigmatizing. Based on more recent scientific knowledge that proposes the interaction of multifactorial pathophysiological factors involved on the generation of these disorders, a revised definition was created: disorders of gut-brain interaction (DGBI) to help clarify its meaning. These disorders are defined as a group of disorders classified by GI symptoms related to any combination of motility disturbances, visceral hypersensitivity, altered mucosal and immune function, gut microbiota, and/or central nervous system processing. We will be using this new term throughout the article to represent FGIDs. The Rome IV categories and diagnoses for DGBI are listed in Table 2.11 In the following section, we describe the changes and new diagnostic criteria that have been included in Rome IV from the upper to the lower digestive tract. Functional dyspepsia (FD) remains as an umbrella term referring to patients with postprandial distress syndrome (PDS) and epigastric pain syndrome (EPS).38 In general, PDS is a postprandial syndrome while EPS is not. However, pathophysiological studies investigating the effect of meal ingestion on symptom generation demonstrated that not only postprandial fullness and early satiety but also, epigastric pain or burning and nausea may increase after meal ingestion.46 In other words, they can overlap. Therefore, the definition of PDS acknowledges that besides postprandial fullness and early satiety, patients may perceive epigastric pain and/or burning after meals.38 Also, bloating, belching, and nausea can be present both in PDS and EPS, but vomiting is unusual. Secondly, in Rome III a diagnosis of FD could be made with no minimum frequency of occurrence required. However, based on the normative survey, Rome IV now require a minimum frequency of occurrence for the dyspeptic symptoms (ie, postprandial fullness, early satiation, epigastric pain, and epigastric burning) before a diagnosis of FD is made (see above in “Normative Survey”) (Fig. 1). Third, other minor changes included severity identified at least as bothersome (severe enough to impact on daily activities).38 For research purposes, bothersome can be semi-quantitatively defined as ≥ 2 (ie, severe enough to at least distracting from usual activities) in a 5 point-scale to the effect exerted by symptoms on usual activities. Irritable bowel syndrome is the most commonly recognized DGBI around the world, notwithstanding is prevalence remains elusive due to the different diagnostic criteria and survey methods used in research studies.50 However, Rome IV has introduced changes in the diagnostic criteria based on the available evidences,51 as well as on the normative survey.39 Firstly, the term discomfort included in the Rome III criteria is now eliminated from the new Rome IV criteria because a previous study showed that asking about discomfort is nonspecific and should be avoided in future Patient reported outcomes. 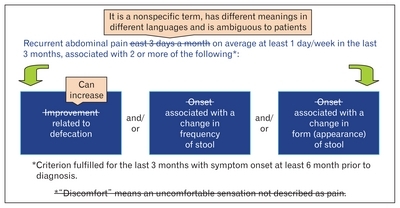 Also, discomfort has different meanings in different languages and is an ambiguous term to patients.51 Thus, only abdominal pain is now included. Based on the Rome normative survey, pain should be present at least 1 day per week during the previous 3 months. As mentioned before, this was supported by the fact that according to the 90th percentile a lower frequency of pain was common in the general population.39,40 In addition, in Rome III, pain or discomfort had to improve with defecation although in many patients, pain increases with defecation or it remains without changes.52 Also, in Rome III, pain or discomfort onset had to be related with the other 2 criteria: onset associated with a changed in frequency of stools; onset associated with a change of form (appearance) of stool.53 Because not in every patient abdominal pain coincided with these changes in stools, onset is now deleted from Rome IV.37 The changes in IBS criteria from Rome III to Rome IV are depicted in Figure 3. It is important to acknowledge that in the first population-based study using Rome IV criteria in English speaking populations, the IBS prevalence decreased by half compared to that with Rome III criteria: 11.1% vs 6.1%, 11.7% vs 5.8%, and 10.6% vs 5.5% in the US, Canada, and the UK, respectively. It is possible that this change is related to the elimination of discomfort from the criteria.54 Also, it is worth mentioning that in other areas like in Asia, patients do differentiate between pain and discomfort and although expressions such as bloating posed difficulty in translatability, bloating is more common than abdominal pain, and patients often report relief of their fullness or bloating with the passage of either stool or flatus.55 Therefore, Rome IV criteria for IBS may need to be adapted in the future for other cultures as the data accumulates using these criteria. In terms of IBS subtypes, IBS is mainly classified according to the predominant bowel habit for IBS-C, IBS-D, IBS with mixed bowel habits, and unclassified IBS.53 In Rome IV, bowel habits are based on stool forms only during days with abnormal bowel movements (more than one-fourth: 25% of bowel movements).37 This is in contrast to Rome III in which the 25% threshold was determined based on the total number of bowel movements irrespective of whether they were normal or not.53 In fact this led to a predominance of unsubtyped IBS using Rome III as it was the case in several epidemiological studies the USA and Latin America.56–58 The Rome IV IBS subtypes criteria49 are depicted in Table 3. Functional abdominal bloating/distension is diagnosed when either abdominal bloating (subjective) and/or distension (objective/ visible increase in abdominal girth) predominate over other symptoms.49 The addition of distension also reflects the findings with new technologies such as abdominal plethysmography.59 Rome IV recognizes that patients may also report symptoms of mild abdominal pain and/or minor bowel movement abnormalities. Although the Rome criteria are very useful for clinical research and pharmaceutical trials, they have limitations in clinical practice, as many of our patients do not fulfill all the criteria or the necessary time frame to be diagnosed (sub-threshold disorders), however they would receive equivalent treatments. Rome has created the Rome IV Interactive Clinical Decision Toolkit, an intelligent software system that addresses the sophistication and complexity of DGBI diagnosis and treatment protocols by providing an online resource to assist practitioners in achieving optimal clinical outcomes. It offers a powerful online and interactive approach for accessing the combination of the Rome IV Diagnostic Algorithms and the MDCP treatment guidelines on-demand and at the point of care. This software will provide both an educational resource as well as a daily guideline to the patients’ individualized diagnosis and treatment. Using any browser-enabled device, physicians and clinicians interact visually with Rome algorithms and guidelines, seeing all relevant decision pathways developed from actual clinical cases and using touch inputs to highlight and activate the pathways that lead to the optimal outcomes and recommendations. The platform operates in the ways that clinicians need to work: by using a logical, multidimensional and yet individualized framework for proper decision making. Fig. 1. Frequency of reporting of pain or burning above the belly button in the normative survey. The histograms show the frequency of reporting in different time frames for men, women and the combined sample. The vertical dotted line shows the 90th percentile for the combined sample of females and males. 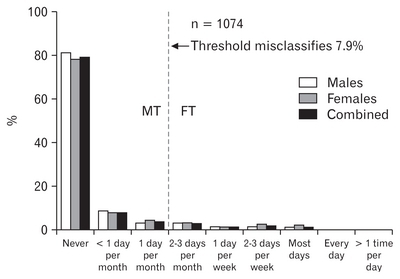 MT shows the minimum threshold in males and FT shows the minimum 90th percentile in females. Accordingly, a threshold of only 2–3 days a month would limit misclassification to 10% in females, whereas a threshold of 1 day/ month would limit misclassification to 10% in males. Reproduced with permission from Rome Foundation, Inc. Fig. 2. Different models to explain functional bowel/disorders of gut-brain interaction. (A) Rome I considered the functional bowel disorders as different and independent entities. (B) Later, Rome II-Rome III recognized that these disorders could overlap between the different functional bowel disorders. (C) Rome IV now considers that bowel disorders exist on a continuum rather than independent disorders. Adapted and reproduced from Whorwell et al with permission from Rome Foundation, Inc. IBS, irritable bowel syndrome; FC, functional constipation; FDr, functional diarrhea; C, constipation; D, diarrhea; M, mixed. 2013–2015 Rome IV Committees Critically synthesized the literature and created the requested documents through several revisions. IBS-C More than one-fourth (25%) of bowel movements with Bristol Stool Scale Types 1–2 and less than one-fourth (25%) with Types 6–7. IBS-D More than one-fourth (25%) of bowel movements with Bristol Stool Scale Types 6–7 and less than one-fourth (25%) with Types 1–2. IBS-M More than one-fourth (25%) of bowel movements with Bristol Stool Scale Types 1–2 and more than one-fourth (25%) with Types 6–7. IBS-U Patients meet diagnostic criteria for IBS but their bowel habits cannot be accurately categorized in any of the above subtypes. IBS-C, IBS with predominant constipation; IBS-D, IBS with predominant diarrhea; IBS-M, IBS with mixed bowel habits; FODMAPs, fermentable oligo-, di-, monosaccharides, and polyols; HADS, Hospital Anxiety and Depression Scale; DSM, Diagnostic and Statistical Manual of Mental Disorders. Conflicts of interest: Max J Schmulson grant support: Alfa Wassermann, Nycomed/Takeda and Genova Diagnostics Inc; consultant/advisory board: Alfa Wassermann, Commonwealth Diagnostics International Inc, Takeda; speaker: Alfa Wasserman, Commowealth Diagnostics Inc, Mayoly-Spindler, Takeda. Douglas A Drossman is consultant/advisory board of Ironwood, Salix, and Abbvie. Author contributions: Max Schmulson and Douglas A Drossman wrote the manuscript and approved the last version. Thompson, WG, Dotevall, G, Drossman, DA, Heaton, KW, and Kruis, W (1989). Irritable bowel syndrome: guidelines for the diagnosis. Gastroenterol Int, 92-95. Drossman, DA, Thompson, WG, Talley, NJ, Funch-Jeasen, P, and Janssens, J (1990). Identification of subgroups of functional bowel disorders. Gastroenterol Int. 3, 159-172. Thompson, WG, Creed, F, Drossman, DA, Heaton, KW, and Mazzacca, G (1992). Functional bowel disorders and chronic functional abdominal pain. Gastroenterol Int. 5, 75-91. Talley, NJ, ColinJones, D, Koch, KL, Koch, M, Nyren, O, and Stanghellini, V (1991). Functional dyspepsia: a classification with guidelines for diagnosis and management. Gastroenterol Int. 4, 145-160. Richter, JE, Baldi, F, Clouse, RE, Diamant, NE, Janssens, J, and Staiano, A (1992). Functional oesophageal disorders. Gastroenterol Int. 5, 3-17. Whitehead, WE, Devroede, G, Habib, FI, Meunier, P, and Wald, A (1992). Functional disorders of the anorectum. Gastroenterol Int. 5, 92-108. Drossman, DA, Li, Z, and Andruzzi, E (1993). U.S. householder survey of functional gastrointestinal disorders. Prevalence, sociodemography, and health impact. Dig Dis Sci. 38, 1569-1580. Thompson, WG (2006). The road to rome. Gastroenterology. 130, 1552-1556. Drossman, DA (2016). Functional gastrointestinal disorders: history, pathophysiology, clinical features and Rome IV. Gastroenterology. 150, 1262-1279. Marciani, L, Cox, EF, and Hoad, CL (2010). Postprandial changes in small bowel water content in healthy subjects and patients with irritable bowel syndrome. Gastroenterology. 138, 469-477.e1. Barau, E, and Dupont, C (1990). Modifications of intestinal permeability during food provocation procedures in pediatric irritable bowel syndrome. J Pediatr Gastroenterol Nutr. 11, 72-77.
van Wijk, HJ, Smout, AJ, Akkermans, LM, Roelofs, JM, and ten Thije, OJ (1992). Gastric emptying and dyspeptic symptoms in the irritable bowel syndrome. Scand J Gastroenterol. 27, 99-102. Gwee, KA, Leong, YL, and Graham, C (1999). The role of psychological and biological factors in postinfective gut dysfunction. Gut. 44, 400-406. Camilleri, M, Northcutt, AR, Kong, S, Dukes, GE, McSorley, D, and Mangel, AW (2000). Efficacy and safety of alosetron in women with irritable bowel syndrome: a randomised, placebo-controlled trial. Lancet. 355, 1035-1040. Van Outryve, M, Milo, R, Toussaint, J, and Van Eeghem, P (1991). “Prokinetic” treatment of constipation-predominant irritable bowel syndrome: a placebo-controlled study of cisapride. J Clin Gastroenterol. 13, 49-57. Sperber, AD, Gwee, KA, and Hungin, AP (2014). Conducting multinational, cross-cultural research in the functional gastrointestinal disorders: issues and recommendations. A Rome Foundation working team report. Aliment Pharmcol Ther. 40, 1094-1102. Francisconi, CF, Sperber, A, and Fang, X (2016). Multicultural aspects in functional gastrointestinal disorders (FGIDs). Gastroenterology. 150, 1344-1354. Eisenberg, L (1977). Disease and illness. Distinctions between professional and popular ideas of sickness. Cult Med Psychiatry. 1, 9-23. Keefer, L, Drossman, DA, and Guthrie, E (2016). Centrally mediated disorders of gastrointestinal pain. Gastroenterology. 150, 1408-1419. Mearin, F, Lacy, BE, and Chang, L (2016). Bowel Disorders. Gastroenterology. 150, Array-1407. Palsson, OS, Whitehead, WE, and van Tilburg, MA (2016). Development and validation of the Rome IV diagnostic questionnaire for adults. Gastroenterology. 150, 1481-1491. Schmulson, M, Adeyemo, M, and Gutiérrez-Reyes, G (2010). Differences in gastrointestinal symptoms according to gender in Rome II positive IBS and dyspepsia in a Latin American population. Am J Gastroenterol. 105, 925-932. Savarino, E, Marabotto, E, and Zentilin, P (2011). The added value of impedance-pH monitoring to Rome III criteria in distinguishing functional heartburn from non-erosive reflux disease. Dig Liver Dis. 43, 542-547. Aziz, Q, Fass, R, Gyawali, CP, Miwa, H, Pandolfino, JE, and Zerbib, F (2016). Functional esophageal disorders. Gastroenterology. 150, 1368-1379. Sperber, AD, Dumitrascu, D, and Fukudo, S (). The global prevalence of IBS in adults remains elusive due to the heterogeneity of studies: a Rome Foundation working team literature review. Gut. Spiegel, BM, Bolus, R, and Agarwal, N (2010). Measuring symptoms in the irritable bowel syndrome: development of a framework for clinical trials. Aliment Pharmacol Ther. 32, 1275-1291. Hellstrom, PM, Saito, YA, Bytzer, P, Tack, J, Mueller-Lissner, S, and Chang, L (2011). Characteristics of acute pain attacks in patients with irritable bowel syndrome meeting Rome III criteria. Am J Gastroenterol. 106, 1299-1307. Palson, O, van Tilburg, M, Simren, M, Sperber, AD, and Whithead, W (2016). Mo1642 population prevalence of Rome IV and Rome III irritable bowel syndrome (IBS) in the United States (US), Canada and the United Kingdom (UK). Gastroenterology. 150, S739-S740. Morgan, D, Martin, C, and Pena, E (2012). Significant differences in Rome II and Rome III determination of FGID prevalence: Population-based assessments in Central America. Gastroenterology. 142, S573. Schmulson, M, Lopez-Colombo, A, Mendoza-Gomez, A, Montiel-Jarquin, A, and Morgan, D (2012). Tu1426 The Rome III adult questionnaire in Spanish-Mexico has a low sensitivity for identifying IBS and higher sensitivity for uninvestigated dyspepsia. Gastroenterology. 142, S829. Drossman, DA, Morris, CB, and Hu, Y (2005). A prospective assessment of bowel habit in irritable bowel syndrome in women: defining an alternator. Gastroenterology. 128, 580-589. Lewis, MJ, Reilly, B, Houghton, LA, and Whorwell, PJ (2001). Ambulatory abdominal inductance plethysmography: towards objective assessment of abdominal distension in irritable bowel syndrome. Gut. 48, 216-220. Kalso, E, Edwards, JE, Moore, RA, and McQuay, HJ (2004). Opioids in chronic non-cancer pain: systematic review of efficacy and safety. Pain. 112, 372-380. Jamal, MM, Adams, AB, Jansen, JP, and Webster, LR (2015). A randomized, placebo-controlled trial of lubiprostone for opioid-induced constipation in chronic noncancer pain. Am J Gastroenterol. 110, 725-732. Argoff, CE, Brennan, MJ, and Camilleri, M (2015). Consensus recommendations on initiating prescription therapies for opioid-Induced constipation. Pain Med. 16, 2324-2337. Drossman, DA (2013). 2012 David Sun lecture: helping your patient by helping yourself--how to improve the patient-physician relationship by optimizing communication skills. Am J Gastroentetol. 108, 521-528. Trivedi, MH, Fava, M, and Wisniewski, SR (2006). Medication augmentation after the failure of SSRIs for depression. N Engl J Med. 354, 1243-1252. Grunkemeier, DM, Cassara, JE, Dalton, CB, and Drossman, DA (2007). The narcotic bowel syndrome: clinical features, pathophysiology, and management. Clin Gastroenterol Hepatol. 5, 1126-1139. Drossman, DA, Morris, CB, and Edwards, H (2012). Diagnosis, characterization, and 3-month outcome after detoxification of 39 patients with narcotic bowel syndrome. Am J Gastroenterol. 107, 1426-1440. Cotton, PB, Elta, GH, Carter, CR, Pasricha, PJ, and Corazziari, ES (2016). Rome IV. Gallbladder and sphincter of oddi disorders. Gastroenterology. 150, 1420-1429.e2. Cotton, PB, Durkalski, V, and Romagnuolo, J (2014). Effect of endoscopic sphincterotomy for suspected sphincter of Oddi dysfunction on pain-related disability following cholecystectomy: the EPISOD randomized clinical trial. JAMA. 311, 2101-2109. Toouli, J, Roberts-Thomson, IC, Kellow, J, Dowsett, J, Saccone, GT, Evans, P, Jeans, P, Cox, M, Anderson, P, Worthley, C, Chan, Y, Shanks, N, and Craig, A (2000). Manometry based randomised trial of endoscopic sphincterotomy for sphincter of Oddi dysfunction. Gut. 46, 98-102. Rao, SS, Bharucha, AE, and Chiarioni, G (2016). Anorectal disorders. Gastroenterology. 150, 1430-1442.e4. Prott, G, Shim, L, Hansen, R, Kellow, J, and Malcolm, A (2010). Relationships between pelvic floor symptoms and function in irritable bowel syndrome. Neurogastroenterol Motil. 22, 764-769. Grossi, U, Carrington, EV, Bharucha, AE, Horrocks, EJ, Scott, SM, and Knowles, CH (2016). Diagnostic accuracy study of anorectal manometry for diagnosis of dyssynergic defecation. Gut. 65, 447-455. Rao, SS, Mudipalli, RS, Stessman, M, and Zimmerman, B (2004). Investigation of the utility of colorectal function tests and Rome II criteria in dyssynergic defecation (Anismus). Neurogastroenterol Motil. 16, 589-596. Ratuapli, SK, Bharucha, AE, Noelting, J, Harvey, DM, and Zinsmeister, AR (2013). Phenotypic identification and classification of functional defecatory disorders using high-resolution anorectal manometry. Gastroenterology. 144, 314-322.e2. Benninga, MA, Faure, C, Hyman, PE, St James Roberts, I, Schechter, NL, and Nurko, S (2016). Childhood functional gastrointestinal disorders: neonate/ toddler. Gastroenterology. 150, 1443-1455.e2. Hyams, JS, Di Lorenzo, C, Saps, M, Shulman, RJ, Staiano, A, and van Tilburg, M (2016). Functional disorders: children and adolescents. Gastroenterology. 150, 1456-1468.e2.